THE MOUTH OF THE JORDAN and northern end of the Dead Sea. The large white patches on either side of the river are the immense evaporating pans of the potash works. The pans cover an area of 1,000 acres. Besides potash, the waters of the Dead Sea are impregnated with bromine and magnesium chloride. UPON the shores of that strange sheet of salt and bitter water, the Dead Sea, in Palestine, are extensive works - evaporating pans, refineries, workshops, power house, pumping stations - for the recovery of potash. Other prized salts are drawn, too, from the brine-laden waters of the sea by a great suction pipe. The waters of the Dead Sea were long known to be impregnated with valuable salts, such as potash, bromine and magnesium chloride, but the problem was the recovery of them on a commercial scale. Hitherto potash had been chiefly supplied from the mines of Germany and France. To extract it and the other coveted salts from the waters of the Dead Sea called for considerable pioneer and experimental work extending over many years in an exceedingly hot, barren and isolated, but not unhealthy region. Potash is a white powder, somewhat resembling fine table salt. Ninety per cent of the potash produced to-day is used as a fertilizer. It can be used in the natural state, or mixed with phosphates or nitrates. It also finds a place in the manufacture of explosives. Bromine is a dark, reddish brown, highly corrosive liquid, which is easily made volatile, giving off heavy vapours. It enters commerce largely in the form of its salts, of which sodium bromide, potassium bromide and ammonium bromide are used in almost every civilized country. The principal outlet for bromine, however, is as ethylene dibromide used in tetraethyl lead, forming antiknock compounds which, when added to petrol, assure the smooth running of motor car engines. The Dead Sea is a great storehouse of valuable chemicals. The Dead Sea forms part of a depression, or rift, in the earth’s surface. The rift extends much farther than the boundaries of Palestine. From Lebanon, in Syria, it goes down through the Lake of Tiberias, the Jordan Valley and the Dead Sea to the Gulf of Aqaba. Thence, crossing to the African continent, it reaches the great lakes in Central Africa. The length of the trough from the source of the Jordan to the Gulf of Aqaba is 260 miles, and the width varies from five to sixteen miles. In the neighbourhood of the Dead Sea this depression reaches its greatest depth, the surface of the Dead Sea being 1,292 feet below the level of the Mediterranean. The Dead Sea is the lowest lying sheet of water on the face of the globe, and it has a length of over forty-seven miles, an average breadth of nine miles and a maximum depth of nearly 1,300 feet. This inland sea is mainly fed by the River Jordan, which discharges daily into it more than 8,500,000 cubic yards of water. This is about three-quarters of the total amount of water that flows into the lake. The remaining quarter comes from small streams on the east, chief among them being the Zerka, Arnon, Araba and Fukra. The sea is fed also by subterranean springs, but to what extent it is impossible to say. As the Dead Sea has no outlet the total of 111,000,000 cubic yards of water which it receives on an average day is dispersed entirely by solar evaporation in fresh water vapour, leaving the salts in solution. The waters of the Dead Sea are so salt and bitter that no fish can live in them, and it is impossible for a human body to sink. That does not mean to say that a bather could not drown in the Dead Sea, for the water getting into the eyes sets up a stinging sensation which makes him temporarily unconscious. At Kallia, the pleasure and health resort which was established at the north-eastern corner of the lake when the northern shore was taken over by the potash company for its works, diving is not allowed and bathers are warned not to get the waters into their eyes. The workers at the potash plants are not allowed to stay in the water more than a quarter of an hour at a time unless there are facilities for a douche in fresh water. Before the work of recovering the salts of the Dead Sea could be put in hand prolonged and systematic observations and experiments were necessary. Although explorers, attracted to the region, had supplied interesting information concerning its physical peculiarities, none had made any serious attempt to examine the possibilities of a commercial exploitation of its mineral wealth. It was necessary to know the exact salt contents of its waters, and to what extent its specific gravity varied at different depths. Could the salts be recovered by solar evaporation? What was the difference between high and low sea level? Was the open ground bordering the northern end of the lake suitable for the establishment of evaporating pans, refineries and the necessary plant? These and many other questions called for lengthy experimental work. The specific gravity of the brine is 1·1725 at 23 degrees Centigrade. Although the ratio between the various salts remains almost constant there is an increase in specific gravity from the surface downwards. The analysis shows that the water of the Dead Sea contains roughly 275 grammes of salts in a litre at a depth of about 16 feet from the surface. The average concentration of other sea waters does not exceed 35 grammes of salt per litre, which is roughly eight times less than the concentration encountered at the Dead Sea. Such a phenomenon is unique. A GREAT RIFT, or depression in the earth’s surface, extends south from Lebanon in Syria, to the Gulf of Aqaba, at the head of the Red Sea, and reappears in Africa. In this depression are the Lake of Tiberias and the Dead Sea, connected by the River Jordan. The Dead Sea, where the rift is at its lowest, has a length of over forty-seven miles, an average breadth of nearly nine miles and a maximum depth of 1,300 feet. An outstanding feature of Dead Sea brine is that it is composed of six definite materials, four of which have only one acid group in common, the chloride. Calcium sulphate occurs in so small a quantity that it may be neglected, thus leaving four metallic elements and two acid groups, chloride and bromide. This is a remarkable salt composition from the point of view of salt solubilities or salt equilibrium. All the five salts present in the Dead Sea brine are materials that the world needs, when properly transformed into marketable form. Upon the northern shores of the Dead Sea Mr. Novomeysky erected an experimental plant consisting of a suitable pump and three small tanks made of reinforced concrete, of which the second and third were subdivided into two. The uppermost tank, for the separation of sodium chloride, was filled with surface water. The lower two tanks were reserved for the separation of carnallite and magnesium bromide respectively. Carnallite is a double salt composed of about 80 per cent of magnesium and 20 per cent of potassium chloride. A clay pan, whose walls were formed of wooden frames with the space between filled with puddled clay, was erected also. The pan was divided into two unequal portions by a wall containing a sluice gate. 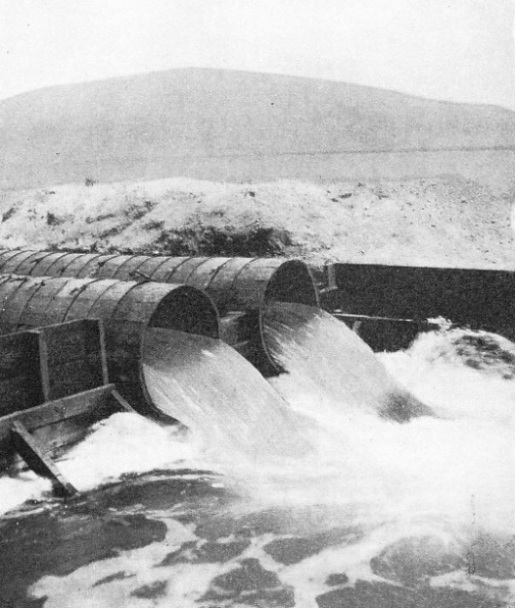 The larger portion, designed for the separation of common salt, was filled with water; the smaller portions, fed through the sluice gate, was reserved for the carnallite. Regular measurements of temperature and evaporation were taken three times daily, and analyses were made of the liquors and salts precipitated at various stages of evaporation. The process of evaporation consisted of three stages; the common salt period, the carnallite period and the magnesium chloride period. The earlier experiments showed that to produce a high-grade carnallite having the maximum amount of sodium chloride, the second stage of evaporation should be carried out not in one uninterrupted process, but in two or even three stages and each in a separate pan. Evaporation in the clay pan gave similar results. The experimental work proved conclusively that potash, despite its low percentage, a little over 1 per cent in the waters of the Dead Sea, could be recovered as carnallite containing about 20 per cent of potassium chloride, by solar evaporation in open pans. The carnallite thus obtained could be converted into a high-grade potash by a single treatment with cold water. Before those in charge could begin this method of extraction and treatment, which had not been used hitherto in the potash industry, it was necessary to learn something of the general climatic conditions of the region such as temperature, rainfall, direction and velocity of wind, and the rise and fall of the waters of the lake. No reliable data concerning these points were available at that time. A well-equipped meteorological station was installed and observations were carefully noted. For eight months of the year, from March to October, the region is dry and without rain. The rainfall in the winter months is scanty, the annual maximum over a period of four years being only 2½-in. The region is notoriously hot in the summer, the maximum temperature in the sun reaching 149 to 167 degrees Fahrenheit. The temperature of the water is often higher than that of the surrounding air. A peculiarity of the region is that there are two maximum and two minimum temperatures daily. The first maximum in the summer is recorded in the morning and the second between 4 and 7 p.m. The first minimum occurs shortly before sunrise and the second about noon. The explanation is largely to be found in the wind system. It is these breezes and the dry heat that make life bearable at the Dead Sea. At the northern end the wind blows from three directions. There is a dry north wind during the night from the Jordan Valley. A moist south wind blows during the day until 4 p.m. This is followed, after a short windless interval, by a dry and hot west wind which blows until the first hours of the night. At the southern end of the Dead Sea the winds are generally warmer than those in the north, as is also the temperature. The average annual range between high and low sea level spread over a period of several years was found to be about 2½ feet. The air in the region of the Dead Sea contains 6 per cent more oxygen than any other place in the world. Work preliminary to the laying down of a fully equipped plant was begun on the northern shore in February 1930. First a motor road was built to link the site with the Jerusalem-Jericho road. Workmen were collected and barracks were built to house them, and the desolate region became a place of much activity. Evaporating pans were built as well as a refinery, power house, pumping station and a workshop. Within a year from the beginning of the work the first bromine plant, with a daily capacity of one ton, was in operation. In February 1932 the first few hundred tons of potash, in the form of high-grade potassium chloride, were sent away. The first part of the programme, namely, to produce 10,000 tons of potassium chloride and about 250 tons of bromine a year, was completed by the end of 1932. Based on the results of the experience gained with this plant and on the mistakes made, improvements were introduced, and the plants for the manufacture of potash and bromine were enlarged. Their present annual output is from 25,000 tons to 30,000 tons of potash, and from 1,000 tons to 1,200 tons of bromine. Since the flat land at the northern end of the lake, suitable for building pans, is limited, the company has acquired about twenty-three square miles of ground at the southern end of the sea, where , extensive plant is being laid down. Close by is Jebel Usdum, a mountain of rock salt five miles long and 500 feet high. 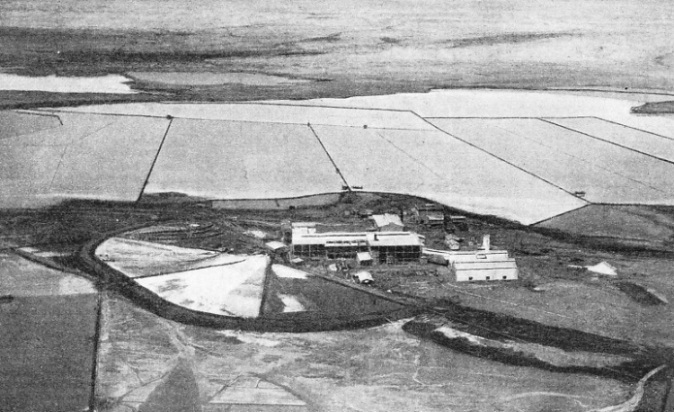 THE POTASH WORKS, seen from the air. The large evaporating pans are protected by ten miles of dikes (in the background). In the foreground are the power house and factory. The first few hundred tons of potash, in the form of high-grade potassium chloride, were sent away in February 1932. A few years later large quantities of potash salts and bromide were being obtained. There are many historic sites round the Dead Sea. At the north-eastern corner of the lake stands Mount Nebo, from which Moses viewed the Promised Land. Everywhere there are signs of great volcanic disturbances which has rent this region in past ages. Government experts who have made independent investigations declare that there are more than 1,000,000,000 tons of potash, over 800,000,000 tons of bromine, and other salts in proportion in this single sheet of water, sufficient to supply the world’s present needs for the next 2,000 years. But these valuable salts are continually being added. They are brought down by the Jordan in solution from the hot springs of Tiberias and also pour into the lake from the hot springs in its immediate neighbourhood. The Jordan alone pours into the Dead Sea about 40,000 tons of potassium chloride yearly. 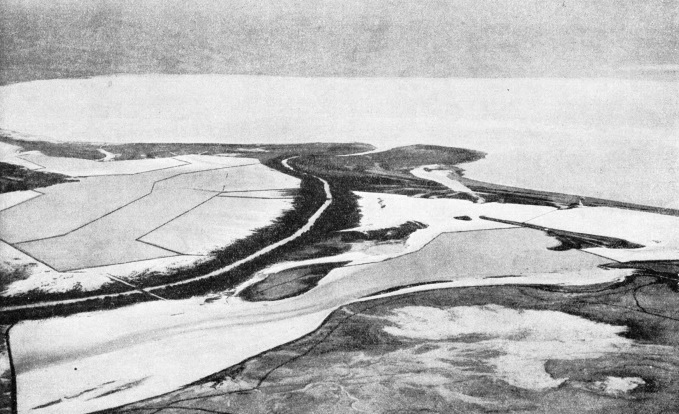 During the first two years of operation the water for filling the pans in the northern area was drawn from the surface of the lake. The water is now obtained through a pipe line laid at the bottom of the sea. The pans are shallow, of varying sizes, having surface areas of from 7½ to 30 acres. They run along the shore for a distance of some two miles and extend along either bank of the Jordan. The salt pans are formed by earth dams about 4 feet high and 5 feet wide, the carnallite pans by timbered clay dams about 3 feet high and 2½ feet wide. The carnallite pans follow the contour of the land and cover an area of about 1,000 acres. The water is pumped into the pans from a pipe line laid on the bottom of the sea to a depth of 175 feet. It is a steel pipe, of 30 in. diameter and 2,500 feet long, with its suction end 2,350 feet from the shore. Soundings showed that at a depth of 175 feet the water contains twice as much potash and bromine as on the surface. The pipe was manufactured in lengths of 25 feet with tapered socket ends, ready for welding the joints by acetylene. The profile on which the pipe is laid, starting from the shore, is a long even incline for the first 1,625 feet, down to a depth of 42 feet, beyond which the bottom slopes steeply in a long irregular vertical curve till a depth of 175 feet is reached. As most of this steeply sloping section was beyond ordinary diving depths, it was decided to lay it in one length of pipe. The required numbers of lengths were jointed and welded together before they were launched. The lower end of the pipe was fitted with an upturned bell-mouth entry. From the upper end of this deep-water section the pipe was laid in lengths of 225 feet or 250 feet the ends having loose-flange joints to be connected up in place by a diver who would work in depths not greater than 42 feet. The pipes were mounted on small trucks, one to each truck, gunning on a 2-feet track laid at right angles to the shore The pipes were then joined together and welded by the acetylene process. The welding burnt off the asphalt coating with which each pipe was protected internally and externally and this had to be carefully renewed. As four pipes were welded at one time it meant that the workmen had to crawl in 100 feet from the end In the summer heat this was found to be unbearable except during an hour or two just before sunrise. The course of the pipe line was marked with a wire rope supported every 165 feet by floats. The absence of any suitable boats or barges made the work of launching the pipe doubly difficult. Five small boats and one motor launch were available, but of these only three rowing boats and the launch were of use in the work. Wooden rafts, each having a buoyancy of 2 tons, were used to support the weight of the pipe when moving it out into position, and rafts carrying 1½-ton winches were used for lowering the pipe to the sea bottom. BRINE FROM THE DEAD SEA being pumped into the canal from which the pans are fed. Experimental work proved that potash could be recovered as carnallite containing about 20 per cent of potassium chloride, by solar evaporation in open pans. The carnallite - containing about 80 per cent of magnesium and 20 per cent of potassium chloride - could be converted into high-grade potash by a single treatment with cold water. Ninety per cent of the potash produced to-day is used as a fertilizer. Considerable difficulty was experienced in launching the deep-water section of the pipe. It took six days, because of unfavourable weather and other causes. When ready for launching the pipe lay on twenty-seven wagons at right angles to the shore. As the earthen track on which the rails were laid had been recently made, the line sank in places. The load, being a fairly rigid beam more than 600 feet long, could not follow the irregularities of the track and several derailments took place. When the section had been launched it was found that the rafts could not take the weight, and oil drums had to be lashed below the pipe to give it more buoyancy. Except for an English foreman and a pipe welder supplied by the manufacturers, all the men, Jews or Arabs were drawn from among those employed on the potash works. The Jews represented many nationalities and no one language was understood by them all. It was a sailor’s job, and few of them had had any experience of boat work or in handling ropes. In the winter the Dead Sea can be rough, and many of them suffered from sea-sickness, and on the unstable rafts they were continually being thrown into the water. As soon as the pipe was clear of the shore it was hauled by ropes to the correct position. When ready for lowering it was suspended by the winch lines about 8-in or 9-in below the rafts. As it was necessary to lower one end to 42 feet and the other to 175 feet, the winch lowering lines were marked off in colours representing the different amounts each man would have to let out his line. Orders for lowering were issued to the winch men by exhibiting flags of colours corresponding to the colour bands on the lines. When all was ready for lowering, the work had to be abandoned because of unfavourable weather. Next day was spent in repairing the damage done to anchors and pontoons. At sunrise on the third day, however, a successful attempt was made and the pipe was lowered in about three and a half hours. The lowering of the shorter lengths did not present such difficulties in the shallower waters of the sea. A diver was now sent down to bolt up the flexible joints. When the pipe was finally fixed and tested it was clear that the underwater joints had not been properly bolted. A diver was brought out from England and he reported that none of the joints had been properly made. He made the joints good, but found the work exceedingly trying in the brine-saturated water. On reaching the shore the pipe runs in a trench to a pit some 230 feet inland. Before reaching the pit, however, it is divided into two, each section being connected to a 16-in pump driven by a 120-horse-power electric motor. The pumps have a capacity of more than 200,000 gallons an hour. They deliver the brine to the farthest and highest of the pans, which are so arranged as to allow a constant slow movement of the brines from one pan into another in a zigzag, downward flow along the slope falling towards the Dead Sea. The pans are provided with sluices permitting regulation of the flow or the temporary shutting off of any of the pans when needed. In the course of such a tardy flow, the brine becomes more and more concentrated. Common salt is the first salt to be deposited in the pans. On further concentration carnallite, or crude potash, separates out. The carnallite is harvested mechanically as soon as three to four inches have been deposited. It is then conveyed to the field mixers in the refinery, where it is decomposed with cold water, and on further treatment in the refinery muriate of potash (sea-water potash) is produced to any desired degree of purity. The brine left after carnallite separation, or final brine, contains the entire bromide in a concentrated form, which is conveyed by pumping to a bromine factory, where liquid bromine of a high degree of purity is extracted from the bromide. Another portion of the final brine is left to concentrate further in pans till a specific gravity of 1 ‘37 is reached during the hottest part of the summer. At this point crystals of magnesium chloride separate out in the shape of long needles which are collected and further treated for the market. The remaining brine contains all the calcium chloride which can also be extracted by a fairly simple method. In the production of these valuable chemicals the company finds it necessary to import but a single raw material, diesel oil, for generating electric power. MAKING READY FOR LAUNCHING THE PIPE LINE. Water for filling the pans is obtained through a pipe line laid at the bottom of the Dead Sea. The steel pipe, of 30-in diameter and 2,500 feet long, was made in lengths of 25 feet. For the first 1,625 feet the pipe had to follow a gentle slope to a depth of 42 feet, and then a steep, irregular incline, to a maximum depth of 175 feet. 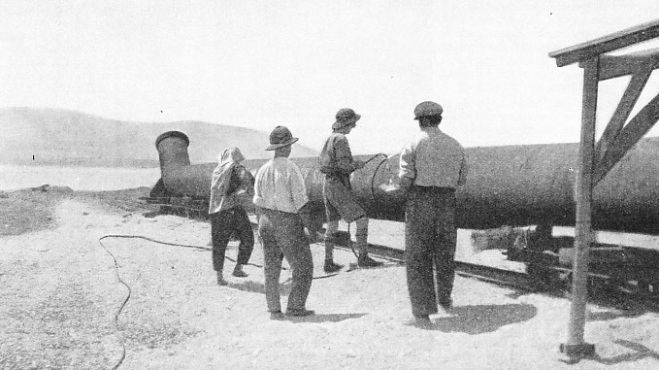 When ready for launching, the pipe lay at right angles to the shore on twenty-seven wagons, some of which are seen in the photograph. Because of bad weather and other difficulties, the launching took six days.